Five links to various recordings will be posted tonight. Disc One:late 70s? gig by Roky and the Explosives. Damaged BOC/punk/metal greatness, but the quality of this recording isn’t the best. Disc Two: Never Say Goodbye CD”: The Emporer Jones label put this out in the late 90s. This is the one to download. It is such a bumber, kind of hopeful and ridiculous at the same time. Disc Three: Casting the Runes: A better recording of Explosives/Aliens era Roky. Really great recordings and includes the best of this era. Disc Four: !3th Floor Elevators Live at the Avalon Ballroom 1966: Insane live set by the Elevators at their peak. Great recording. In fact all of these discs besides the first one are of great audio quality. I have had three separate introductions to the work of Roky Erickson and dismissed him twice before coming to the realization that the man is a musical genius. The teenage version of me sporting a foppish haircut and baggy pants first picked up Easter Everywhere since Primal Scream covered “Slip Inside This House.” I heard only 60s rock and roll and went along my clueless way. My second introduction was in the boudoir of some rockabilly revivalist who played “Two Headed Dog” for me and pounded her fists with ironic aggression. Sadly, I mimicked her movements like a lovesick puppet. I didn’t know it was by Roky Eriickson and figured it be some Blue Oyster Cult song. I was handicapped by a barber’s error as well as my libido and only redeeemed myself when I picked up the Never Say Goodbye comp of unreleased tracks recorded during his time in a mental institution. I was crawling to the end of a long-term relation with a gal from Alabama. I was making a final, awkward visit before my move back to Philadelphia. While she attended to her work, I trudged off to the Dothan mall and engaged in the relaxing pursuits of deals in the used cd bins. I picked up Buffy Saint Marie’s Illuminations and Roky Erickson’s Never Say Goodbye. Both provided a masochistic soundtrack to love’s slow demise. However, there was one track on Never Say Goodbye simply entitled “I Love the Living You” which may be the most uplifting and idealistic love songs I had ever heard. It rekindled an idea of new love in a time when love and new experiences seemed like another rung on a crooked ladder. This album led me to reappraise his career and realize that my former musical tastes blinded me to his work. 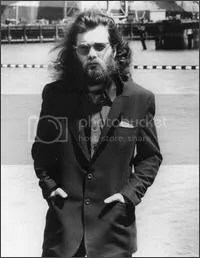 To be honest, there are many stylistic and musical differences between acoustic Roky, Texas psych of the Thirteenth Floor Elevators and the almost metal/punk of his 80s work with the Explosives. These recordings document all three phases of his career. Personally, the lonesome, but innocent vibe of Never Can Say Goodbye is the best place to start. It is one of my favorite albums and has opened the ears of friends who would usually avoid such riffraff. If you like the idea of the 13th Floor Elevators and Blue Oyster Cult jamming together on punk tunes about monsters, aliens and betrayal, then check out the Explosives cds. If you like your 60s psych loud, weird with hallucinogenic jug blowing, then the Elevators are your bag. It’s all great and most of the recordings are spot-on.